As part of her visit to Brussels, Prime Minister Viorica Dăncilă participated today, February 6, 2019, in the plenary session of the European Committee of the Regions (CoR), to present the priorities of the Romanian Presidency of the EU Council. Prime Minister Viorica Dăncilă highlighted the important role of the European Committee of the Regions (CoR) as liaison between the local and regional authorities and the European institutions, and pointed out that CoR will be an important partner during Romania’s tenure. Prime Minister Viorica Dăncilă further presented the four priority action directions of the Romanian presidency, having at core the concept of cohesion as common European value: Europe of convergence, safer Europe, Europe – global actor and Europe of common values. In her address, the Head of the Romanian Executive made reference to the complex dossiers Romania has to manage in the exercise of its mandate: negotiation of the future Multiannual Financial Framework, UK’s withdrawal from the European Union, as well as migration, security and the reflection on the EU’s future. Last but not least, Prime Minister Viorica Dăncilă pointed out that another important objective for Romania is promoting a consolidated framework of macro-regional cooperation, including through EU Strategy for the Danube Region, and thanked the Committee’s members for their openness regarding this topic. I want to thank you, president Lambertz as well as the members of the European Committee of Regions for the invitation to present the priorities of the Romanian Presidency of the EU Council at the plenary session of the European Committee of the Regions, an EU body that represents a real bridge connecting local, regional authorities to European institutions. The European agenda and developments are marked by multiple challenges that we need to respond to, through cohesion, unity and solidarity. That is why the Romanian Presidency of the EU Council takes place under the motto “Cohesion, a common European value” reflecting the importance of returning to the fundamentals of the community building, by pursuing cohesion in all its dimensions: political cohesion, economic and territorial cohesion, social cohesion. The concept of cohesion is transposed into our priorities grouped around four pillars of action: Europe of Convergence, safer Europe, Europe - global actor, Europe of common values. We are all going through a period when we must work together to bring again to the European citizens' attention the benefits of the European project for their everyday lives. We are facing a European context marked by the UK’s withdrawal process from the European Union, negotiations on the Multiannual Financial Framework or other major issues such as: migration and security, reflection on the future of the Union. We must demonstrate together now that the Union has further on the ability to advance in strengthening European policies, to achieve tangible results for citizens. In this respect, the first pillar of the Romanian Presidency’s programme is devoted to "Europe of Convergence". From this perspective, we look closely at the negotiations on the future Financial Framework. The future multiannual budget will have to provide the resources needed to attain the objectives through balance between growth and convergence policies, such as the Cohesion Policy and the Common Agricultural Policy, and the policies designed to respond to new challenges such as migration, security or defence. The future of cohesion policy is also a priority on our agenda. Without this policy, regional and local disparities would have been much greater. The cohesion policy generated partnerships and bridges between Europe’s institutions and regions and its cities. The European Union further needs a solid cohesion policy as main investment strategy. The cohesion policy has evolved managing to cope with the new challenges. At the same time, this policy needs real measures for its simplification and increased efficiency. We will continue negotiations on the cohesion policy at a dynamic pace for the timely adoption of the relevant legislative package. The launch of future operational programs will enable the benefits of this policy to be reflected into the day-to-day lives of Europe's citizens, cities and regions. Allow me to thank the president of the European Committee of Regions for having conveyed a strong signal ever since the start of talks on the future Financial Framework, as regards maintaining the level of the cohesion funds and the need to continue this policy as one aimed at all regions and cities. Promoting a consolidated framework of macroregional cooperation – including through EU Strategy for the Danube Region (EUSDR)- represents another important objective for us. We particularly appreciate your openness to drawing up an opinion on the role of the macroregional strategies. Romania is also involved in the implementation of the Agenda 2030 for sustainable development. We have a new National Strategy for Sustainable Development. We will work to prepare the guidelines for a new EU strategy for sustainable development. Strengthening social cohesion implies ensuring economic convergence at European level. We therefore need a fully functioning single market, free competition and transparent and fair rules of active mobility in all its dimensions. One of the priorities of the Romanian Presidency is also linked to strengthening workers' mobility. In this context, we intend to continue negotiations on dossiers such as the revision of the regulations on social security coordination and the establishment of the European Labor Authority. Ensuring equal opportunities and gender equality is an objective that Romania wishes to promote at European level. An objective has already been attained by reaching a provisional political agreement with the European Parliament regarding the proposal for a Directive on work-life balance for parents and carers. We are preoccupied with strengthening economic growth, European economic resilience, as well as fostering investments at both micro and macro-economic levels. In this respect, the Romanian Presidency will seek to advance talks on deepening the Economic and Monetary Union in a constructive manner, designed to support the increase in cohesion, convergence and its resilience to financial and economic challenges. Romanian Presidency defined the second pillar of its action: „A safer Europe”. The issue of migration is a topic which concerns us all. We intend to continue efforts on all dimensions of its management. In a world of digitalization, protecting citizens’ safety in the virtual space has become an important objective. Public policies and any project regarding the digital environment must take into account the cyber security. Our vision also refers to „Europe as a global actor” with an emphasis on the common commitments assumed through the Global Strategy for the. European Union's Foreign And Security Policy. We will promote the consolidation of European defence and security capabilities, in close complementarity with similar processes within NATO. Ensuring enhanced consistency of European action in the Eastern neighborhood will represent a priority given that this year marks the tenth anniversary of the Eastern Partnership. At the same time, we support the advancement of enlargement policy and, in this respect, particular attention will be extended to the Western Balkans. Last but not least, I want to make a few references to the fourth pillar of our priorities - "Europe of common values". In view of European elections, we must provide a response to the temptation of the Eurosceptic and populist discourse, promoting a more democratic Union, closer to its citizens. We also believe that education and culture represent the key to the future of Europe, both from the individual perspective of the European citizen and from the angle of the consolidation of the European project. Local and regional authorities and communities can play an important role in this area. I am convinced that the 8th European Summit of Regions and Cities, to be held in Bucharest in March, will make an important contribution to conveying a signal of confidence in the future of the Union, of European unity and commitment to a stronger Union over the next decade. Mr President, ladies and gentlemen, we are waiting for you in Bucharest in March! Thank you! As part of her working visit to Brussels to participate in the Conference "The fight against anti-Semitism: a common approach to better protect Jewish communities in Europe - from policy to action," to be held on February 7, the Romanian Prime Minister had a bilateral meeting with the Secretary General of the World Jewish Restitution Organisation Colette Avital. The bilateral relations Romania –Israel were approached in this occasion, with the Prime Minister of Romania emphasizing that the State of Israel is our country’s closest ally and strategic partner in the Middle East. Romania’s recent efforts towards accelerating the process of restitution of Jewish properties were mentioned as well as the legislative developments regarding the payment of allowances for Holocaust survivors. It was agreed on the continuation of cooperation between the Government of Romania and the World Jewish Restitution Organisation on these topics. Moreover, the two interlocutors discussed about the importance of Israel as EU’s strategic partner in a wide range of topics from regional stability and counter-terrorism, to economic development and energy security, education and promotion of common values. During the meeting, the Head of the Bucharest Executive presented the priorities of the Romanian Presidency of the EU Council, with emphasis on the topic of combating anti-Semitism and the Holocaust denial. Colette Avital, ambassador and Israeli politician of Romanian origin, currently serves as Secretary General of the World Jewish Restitution Organisation. Colette Avital was born in 1940 in Bucharest, and emigrated to Israel in 1950, becoming a distinguished personality of the community of Israelis born in Romania. Colette Avital has a long and distinguished career in politics and diplomacy. She was elected as a member of the Knesset for the Labor Party in 1999, being reelected in 2003 and 2006. She served as Deputy Speaker of the Knesset and Member of the Committees for Foreign policy and Defence, Immigration, Absorption and Diaspora Affairs. Prior to entering politics, Colette Avital was a career diplomat, her positions at the Foreign Ministry in Jerusalem included: Director of Training Division, Deputy Director General for Information, Media Communication and Culture Deputy Director General of the Foreign Ministry in charge of European Affairs. She served as Press and Cultural Attaché in Brussels; Minister-Counselor in Paris(1982-1985); Consul in Boston; Ambassador in Lisbon(1988-1992) and Consul General in New York(1992-1996). The WJRO is a non-profit organization based in Jerusalem, founded in 1993. WJRO's activity consists of negotiating with national and local authorities in Central and Eastern Europe on the return of Jewish property abusively seized during the communist regime. WJRO supports the process of restitution of Jewish property as well as the granting of compensations for Holocaust survivors and it closely co-operates with national and local Jewish communities organizations. Today, February 6, Prime Minister Viorica Dăncilă, who is in Brussels, to open the Conference "The fight against anti-Semitism: a common approach to better protect Jewish communities in Europe - from policy to action," event organized by Romania in the context of holding the rotating Presidency of the EU Council, had a bilateral meeting with the European Coordinator on combating anti-Semitism Katharina von Schnurbein. 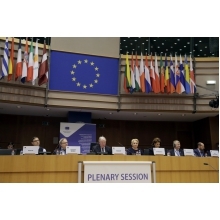 The Romanian official highlighted that the topics of combating anti-Semitism, Holocaust denial as well as the topic of preserving the memory of the Holocaust are a priority for the Romanian Presidency of the Council of the EU, stating that they were included in the fourth pillar of priorities: Europe of common values. The Romanian Prime Minister thanked for the active involvement of the European coordinator in organizing the Conference on combating anti-Semitism, assuring the foreign official of Romania’s support for the European Commission's projects devoted to the implementation of the Council Declaration of December 6, 2018 on combating anti-Semitism and developing a common approach for a better protection of Jewish communities and institutions across Europe. Prime Minister Viorica Dăncilă also provided information on Romania's project to hold a conference on combating Holocaust denial through educational policies and archives material, in Bucharest on March 11, 2019. The event is designed to promote one of the most important projects of Romania on this issue at present - the opening of the National Museum of Jewish History and the Holocaust in Romania. Katharina von Schnurbein, a German national, took over as coordinator of the European Commission on combating anti-Semitism in December 2015. She was one of the main advocates of adopting the working definition of antisemitism within the International Holocaust Remembrance Alliance (IHRA) and after its adoption within the Organization, she has been the main promoter of its adoption at national level as well, by as many member states as possible. Prime Minister Viorica Dăncilă had a bilateral meeting in Brussels with Daniel S. Mariaschin, CEO and Executive Vice President of B'nai B'rith International, in the context of participating in the conference "Fight against Anti-Semitism: a common approach to better protect Jewish communities in Europe - from policy to action," a high level event of the Romanian presidency of the Council of the EU. Prime Minister Viorica Dancila presented the priorities of the Romanian presidency of the Council of the EU on combating Anti-Semitism and the denial of Holocaust. The Romanian official voiced her satisfaction with the activity of the American Jewish organisations in supporting the democratic values and hailed their relation with Romania. In this context, Prime Minister reiterated Romania's commitment and active role in combating the Anti-Semitism phenomenon at international level, through the development of efficient instruments for combating and preventing discrimination, hate speech and hate crime. The Romanian Prime Minister and her interlocutor also voiced concern with respect to the public trends re-capitalizing on xenophobic and Anti-Semitic actions, which could be seen lately in some European states and they voiced their condemnation of such trends. Prime Minister Viorica Dancila presented the current projects carried out in Romania in this area, with an emphasis on the opening of a museum of Jewish History and Holocaust in Romania. Daniel S. Mariaschin is CEO and Executive Vice President of B'nai B'rith International. In this capacity, he coordinates all the programmes and activities carried out by the organisation at world level. He dedicated his entire professional activity to the Jewish organisations and to the promotion of the protection of the rights of the members of the Jewish communities around the world, while also cultivating good relations with the State of Israel. B'nai B'rith International is an organisation whose mission is to promote human rights, promote Israel, foster the unity and continuity of the Jews, and also to ensure safe and affordable housing to low-income seniors and diversified education. Ever since 1843, B'nai B'rith International played a vital role in supporting the Jewish community in the entire world, and helping other communities in crisis. With offices in the entire world, B'nai B'rith is the Global Voice of the Jewish Community. B'nai B'rith International was founded in 1843, in New York, by 12 Jewish immigrants from Europe. Meanwhile, B'nai B'rith has become one of the strongest Jewish organization in the world, with representative offices in more than 58 states and it is present in several international organisations, among which the UN, UNESCO and the European Council.